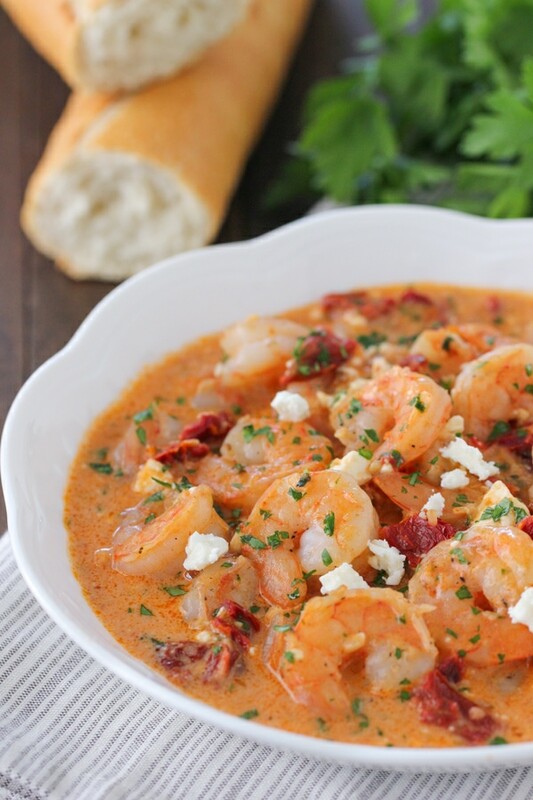 Plump and juicy shrimp smothered in a creamy tomato sauce are just divine. I’ve been meaning to re-create this remarkable dish ever since we tried it at Bonefish Grill with my husband about a year ago. 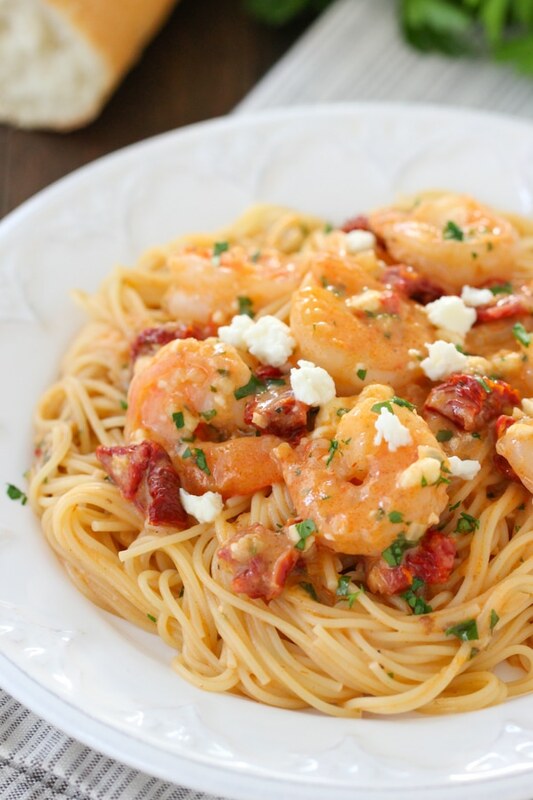 I would have never thought to pair shrimp with feta cheese, but as soon as I put it in my mouth I was instantly wowed and my fork kept reaching for another succulent bite. The cheese softens and melts just a bit, and has that briny, salty flavor that pairs so well with the light tomato sauce. The sun dried tomatoes add a rich, concentrated and sweet tomato flavor. They serve this as an appetizer at Bonefish Grill, along with a loaf of warm, crusty bread. Even though the shrimp were absolutely perfect, the sauce was a little too rich for my liking. Ok, I admit, it felt like the shrimp were swimming in butter. I decided to lighten it up and made a roux to thicken it up a bit and used a lot more broth instead of having it consist of mostly butter. Instead of using about a stick of butter, I used only 1 tablespoon, with just a splash of cream at the very end to make it perfectly smooth and velvety. 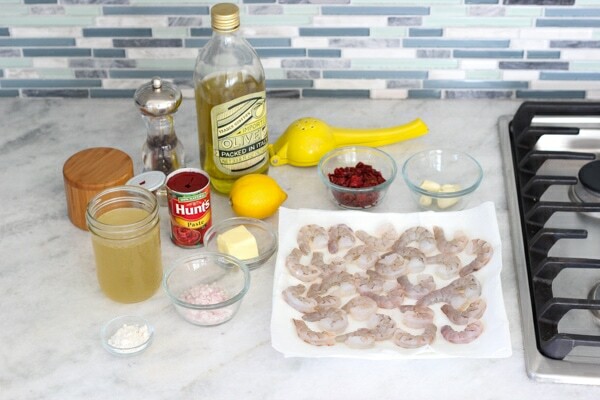 You can serve the shrimp as an appetizer or cook some pasta and make it an entree, which is how I prefer it. 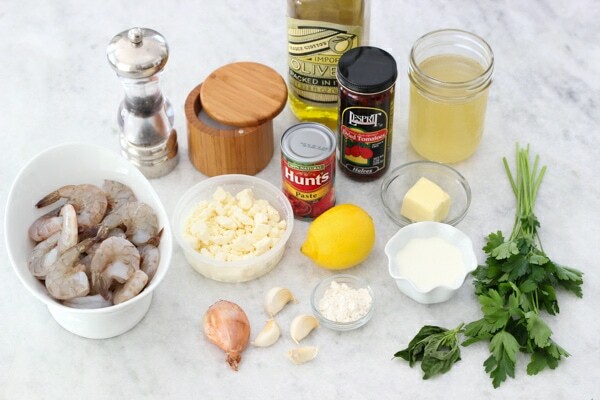 This shrimp meal with a Mediterranean flair is easy to achieve even in the winter months, since the ingredients are pantry staples. You can even add some olives to make it complete. Not bad for a February meal, huh? 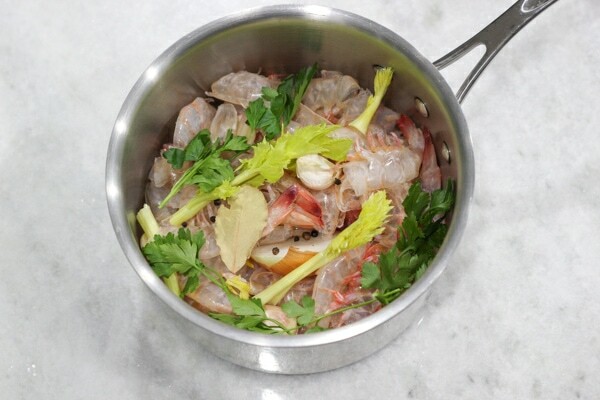 You can save the shrimp shells and make a delicious shrimp broth to use it in this recipe. 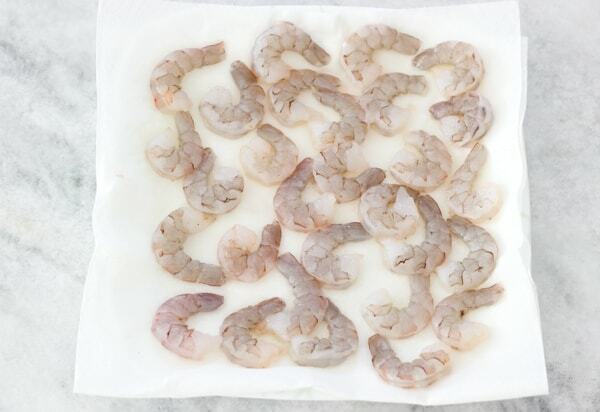 Place the shrimp shells in a medium pot with some aromatics, such as onion, garlic, celery, parsley, bay leaves, whole pepper corns and salt. Fill the pot with water, bring to a boil, reduce to a simmer and cook for about 30-45 minutes. Strain the broth through a fine mesh strainer. Discard the shrimp shells and the aromatics. You can use canned clam juice, vegetable broth or chicken broth in this recipe instead of the shrimp broth. I used my own homemade chicken broth, but I’ve used the shrimp broth too. It tastes superb either way. 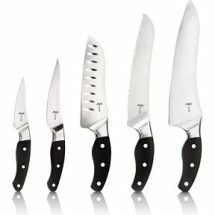 Prep all your ingredients and have them ready to go into the skillet because things happen fast. 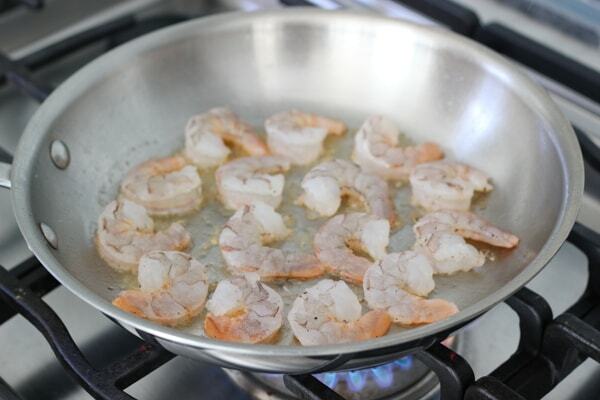 Make sure the shrimp are really dry before you add them to the hot skillet by blotting them on a paper towel. Season the shrimp with salt and pepper. Add half of the oil to the skillet and heat until shimmering on high heat. 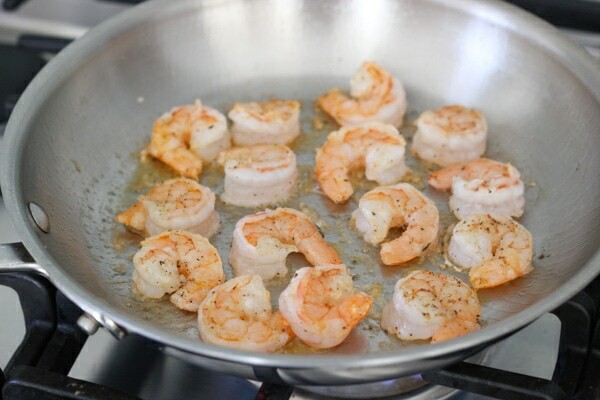 Add half of the shrimp and cook for about 2-3 minutes on one side and 1 more minute on the other side. Set the shrimp aside in a bowl and repeat with the other half of the shrimp. Let’s take a moment to admire these succulent beauties. I could just pop one in my mouth right now. Take care not to overcook them, or they will be rubbery. Reduce the heat to medium low. 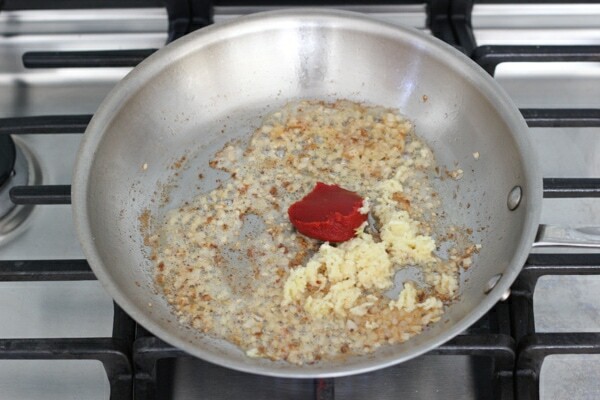 In the same skillet, add the butter and the shallot, scraping the bottom of the skillet to get all the fond off. Cook for 2-3 minutes, until the shallot softens and is slightly golden. Add the garlic and the tomato paste, stirring to combine. Add the flour and cook for about 1 minute. Pour in the broth, whisking until smooth. 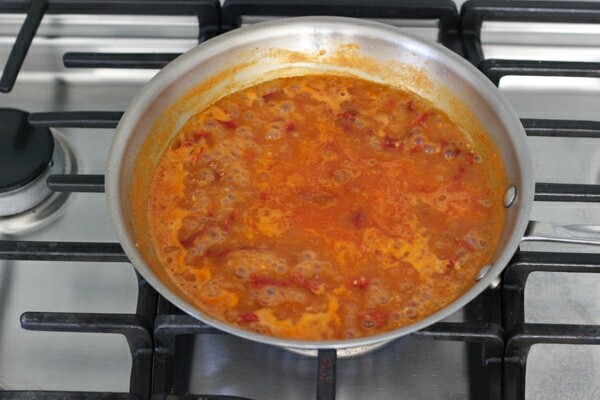 Bring to a boil, reduce to a simmer and cook until the sauce thickens, about 5 minutes. 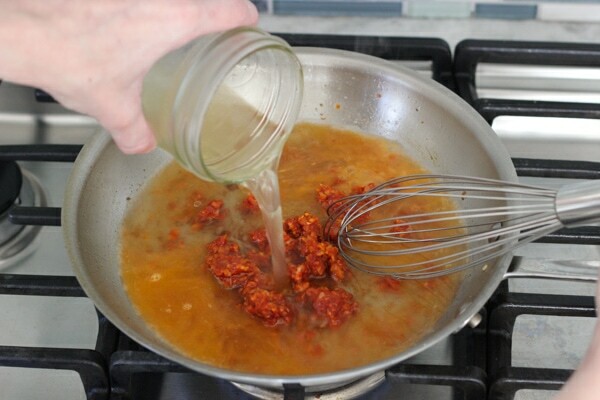 Add the sun-dried tomatoes and the lemon or lime juice. Adjust the sauce consistency by adding more or less broth. The longer you cook the sauce, the thicker it will get. Taste the sauce to see if it needs more lemon juice, salt or pepper. Off the heat, stir in the heavy cream. 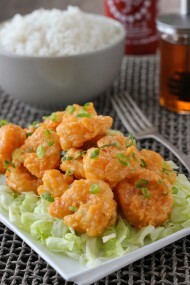 Return the shrimp to the sauce, along with any accumulated juices. Add the feta cheese and the fresh herbs. 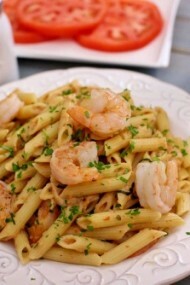 Serve the shrimp as an appetizer with a crusty baguette or as an entree with the pasta of your choice. You can also add some olives, if you’d like. 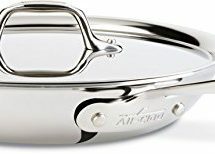 This will serve 2-4 people depending on your appetites and whether you serve it with pasta as an entree or as an appetizer. As you can see, there is a significant amount of sauce. 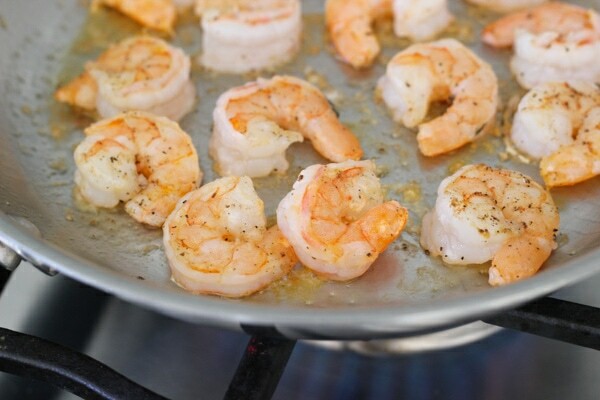 You can easily sear more shrimp to add to the sauce if you like appetizer shrimp to just be coated with the flavorful sauce and don’t like dipping bread in the sauce. If you’re serving this as an entree, the sauce amount is perfect. 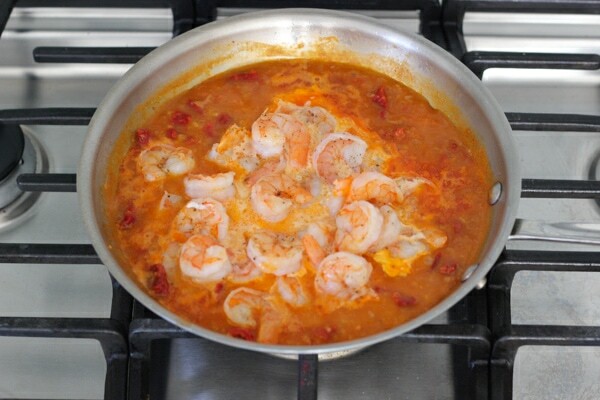 You can save the shrimp shells and make a delicious shrimp broth to use it in this recipe. Place the shrimp shells in a medium pot with some aromatics, such as onion, garlic, celery, parsley, bay leaves, whole peppercorns and salt. Fill the pot with water, bring to a boil, reduce to a simmer and cook for about 30-45 minutes. Strain the broth through a fine mesh strainer. Discard the shrimp shells and the aromatics. You can use canned clam juice, vegetable broth or chicken broth in this recipe instead of the shrimp broth. Reduce the heat to medium-low. 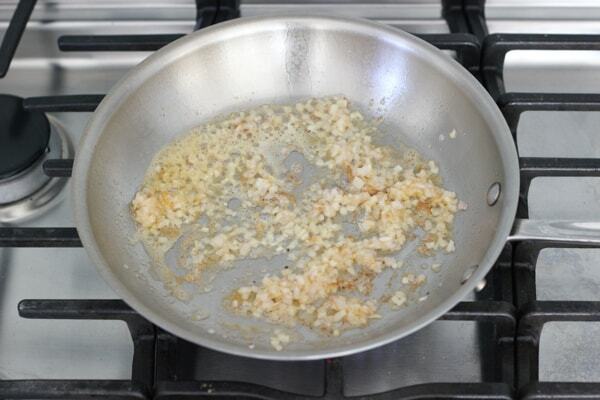 In the same skillet, add the butter and the shallot, scraping the bottom of the skillet to get all the fond off. Cook for 2-3 minutes, until the shallot softens and is slightly golden. Add the garlic and the tomato paste, stirring to combine. Add the flour and cook for about 1 minute. Pour in the broth, whisking until smooth. Bring to a boil, reduce to a simmer and cook until the sauce thickens about 5 minutes. 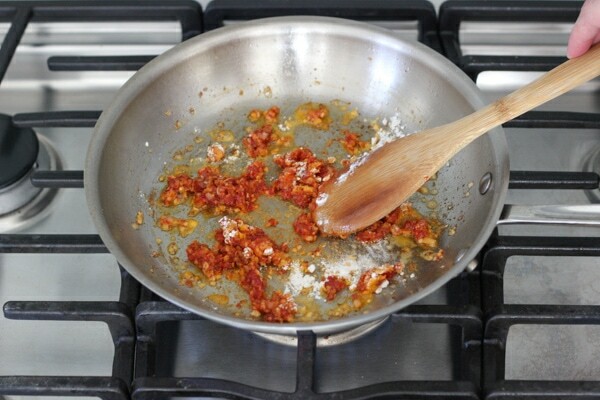 Add the sun-dried tomatoes and the lemon or lime juice. 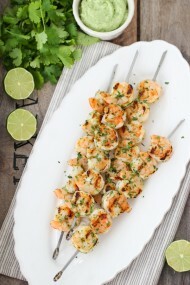 Serve the shrimp as an appetizer with a crusty baguette or as an entree with the pasta of your choice. You can also add some olives if you'd like. This will serve 2-4 people depending on your appetites and whether you serve it with pasta as an entree or as an appetizer. 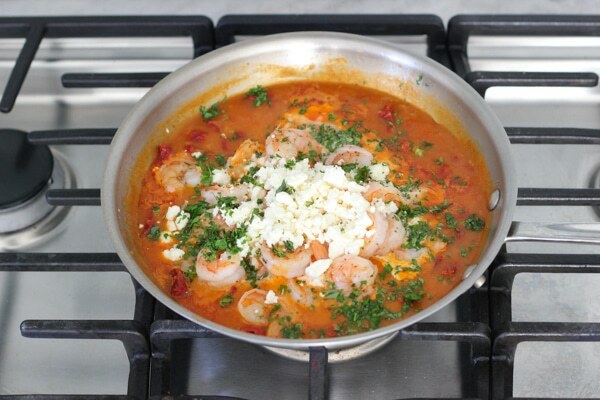 I’ve always enjoyed the combination of shrimp, tomatoes, and feta (or other goat’s or sheep’s milk cheese). And, yes, I know that nothing makes a better broth for sauces for seafood dishes than shrimp, crab, and/or lobster shells. I’ve never put olives into the finished dish, but the suggestion makes perfect sense. I know that your son, Nathaniel, will be making his appearance very soon. I hope that he will grow up to be a happy, healthy person, and that you and his father/your husband will derive every joy from knowing and nurturing him. Thank you, Pat. I hope you give this dish a try. We are excited to welcome Nathaniel into our family very soon. I pinned this, sounds (and looks) mouthwatering. Loads of butter is often the reason why restaurant food tastes so good. I like your approach so much better. Tasty doesn’t always have to be loaded with calories. That’s awesome, Svetlana. Love to read comments like yours. Another WINNER recipe! Thank you and congratulations on your upcoming arrival! Mmmmm! Where did you buy the shrimp? 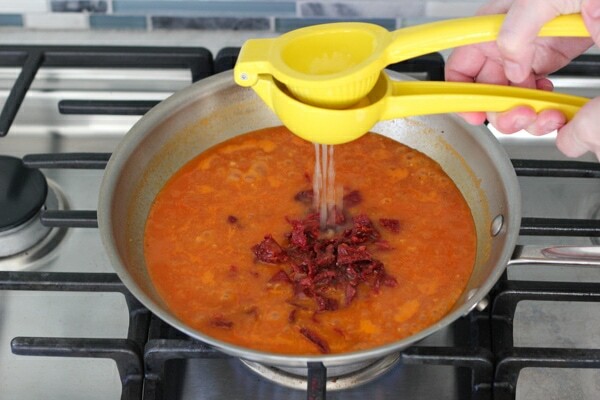 Also what is the citrus juicer that you use called? Thanks!! Sorry, I don’t remember where I bought the shrimp, Julia. I made this recipe awhile ago. I buy shrimp at a local grocery store or a seafood market. The lemon juicer is called a Lemon Squeezer – I use it for limes and oranges too (I cut the oranges into smaller pieces first). I LOVE this tool and use it all the time. 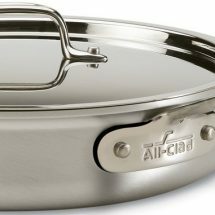 Here’s the same one that I have – http://astore.amazon.com/olgsflafac-20/detail/B0002V23BG. Pure divine! 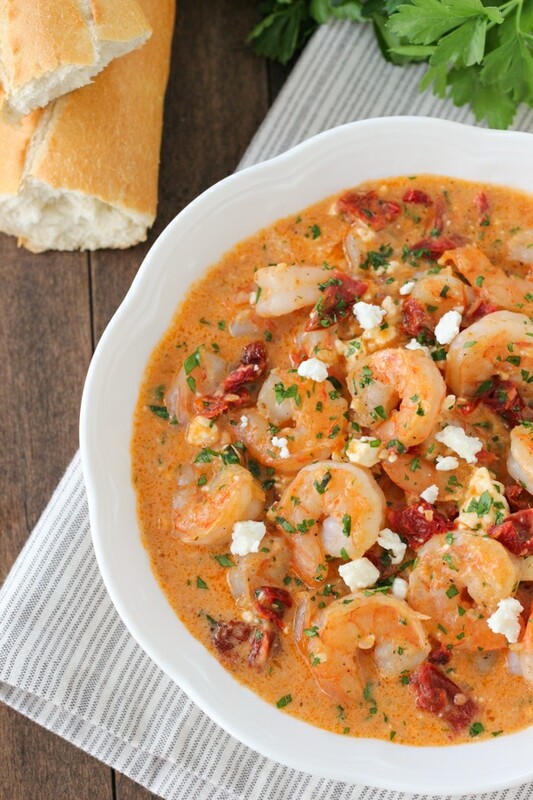 Love all the flavors in it, especially sun-dried tomatoes and feta. Gosh, can’t wait to try it. Can’t wait to try this! Does it matter if I use sun dried tomatoes in oil (and herbs), or I need to get “dry” ones that are sold inn bags? This one is my favorite! my whole family LOVES it! I’m so happy to hear that your family enjoys this dish, Liz. Thanks for taking the time to write. Trying out this recipe right now 🙂 I have a question tho… when do I add the sun dried tomatoes? Do i add them when I add the feta cheese?